Dallying In The Dirt, Issue #240--- Those autumn leaves are garden gold. Pure gold. Not only are the autumn leaves often coloured gold but they also are pure gold as a soil amendment. They are obviously a source of, always needed, organic matter but they also have a storehouse of nutrients that can be returned to the soil. As they colour and dry and fall, most of what they lose is simply water. Many of the nutrients, the trees drew from the soil to make the those leaves, remain locked in that colourful material. Returning it to the soil is Mother Nature's plan and we often thwart her by raking them up and sending them to some distant facility. I can remember when the smell of burning leaves was a sure indicator of autumn. That activity is surely a thing of the past as we realize that we were creating a certain amount of toxic fumes and few of us have a suitable place to undertake that great fall burning ritual. If you don’t mulch your perennial beds then just raking the leaves from the lawn area onto the beds is a great option. Mine are dragged back to the unmulched areas of the garden where most of the vegetables are grown. Weather and worms will eventually integrate those leaves into the soil but I like to give Mother Nature a hand and that’s why you see my lawn mower. It is run over the rows of leaves several time until there is just fragments of leaves left and then they are spread evenly over the entire bed. When I start planting in the spring, I just plant right through what’s left of this layer of gold and that planting action helps to incorporate it into the soil. Now it’s time to winterize the lawnmower and tuck it behind the snowblower in the shed. It was always my intention to use it for mulch in the vegetable garden but we all know what often happens to good intentions. In the upstairs office we have a paper shredder. In an attempt to thwart the identity thieves, anything that goes toward the recycle box will have our name and address removed and shredded. Just occasionally the Assistant Gardener, and maybe even myself, will print something that is not exactly what we intended and it also has personal identification on it and then it makes it through the shredder as well. This creates the large bag of shredded paper that was going to be used as mulch. You can see from the picture that I have developed a much better, and easier to do, use for all of that material. 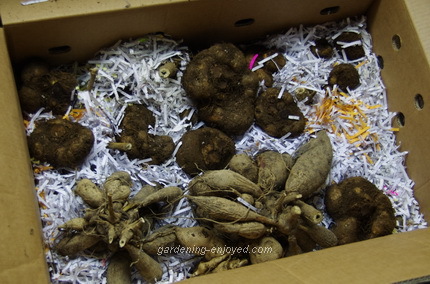 The carefully dried and cleaned tubers from the Tuberous Begonias the similarly treated Dahlias and the Colocasias are nestled into the shredded paper and tucked into a large box. That box arrived with the Tulip bulbs in it and therefore it is quite sturdy and has air holes already punched out of it. When all of the bulbs are dried and packed it will find a spot in a cool corner of the basement to spend the months until their resurrection in early March. They will not make it into the cold room as it often gets much too cold to keep those tubers happy. Boxes and paper get recycled, identity theft is hopefully avoided and a garden of beauty is preserved for next year. This wonderful warm November continues to yield little delights all over the garden. 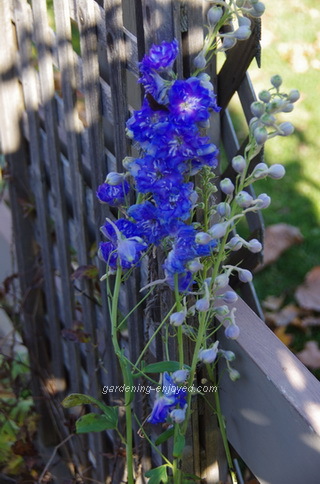 This beautiful blast of blue is a November blooming bunch of Delphiniums. They certainly aren’t as tall and showy as the mid summer bloom but they are in November. When I was cleaning up that bed, I noticed these stalks with their promising array of flower buds so I left them, never believing that the weather would hold long enough to let them develop but there they are. Now if they were adjacent to the bright yellow Iris that is blooming in the back yard, I could pretend that I had actually done some careful colour planning when they were planted but nobody would ever believe me. They were promising freezing temperatures last night so I cut that Iris and brought it in and it seems to be opening up. The beautiful Delphinium was left to fend for itself and it still looks pretty good this morning. I know it did get cold because the grandsons, that live just to the north, were asking why there was snow on their deck but not on the grass in the meadow. Their mother was trying to explain, while wondering why the cushions, that she had put away for the winter, were also on the deck covered in snow. Something about fort building was muttered. Joan Asks? We appear to have raccoons digging up our lawn the last couple of weeks. One night it is the front yard, the next night the back yard. My usually patient husband is starting to get very annoyed with patching up the lawn each morning. They must be looking for grubs which I thought they usually looked for in the early spring. I am trying to make light of it for now & tell my husband that the raccoons are aerating the lawn for us. We know we will need to do some reseeding in the spring and top-dressing with compost. Is there anything we can do NOW to deter them? Ken Answers! I hate to tell you this but racoons rarely dig up the lawn but skunks do it all the time looking for the grubs. You can try to trap them but I could never figure out what to do with a trapped skunk:-) The only real answer is to eliminate the grubs and that's very difficult at this time of year. In warmer weather the beneficial nematodes work well but they will be asleep now. Once the ground freezes they will give up. Valerie Asks I have two pear trees two feet across from each other. One of the trees developed a disease the squirrels and chipmunk ate the few affected pears. I am planning to have this tree cut down. Will the other tree get the disease or will I get pears from it? Ken Answers! Hard to tell if the disease will move over, depending on what type of disease, probably fungal, and the method of transmission. There's probably nothing you can do about it except to hope. 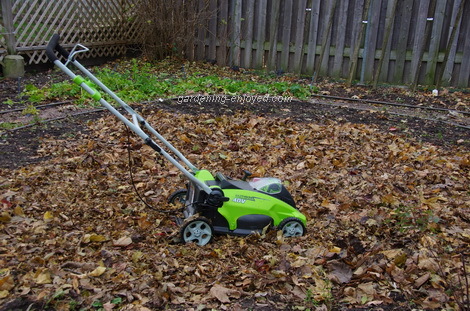 Rake up all the fallen leaves and get rid of them in case the fungal spores overwinter on those fallen leaves. The other tree should still produce fruit, if it stays healthy, as most pears are self fruitful and don't need a cross pollinator.